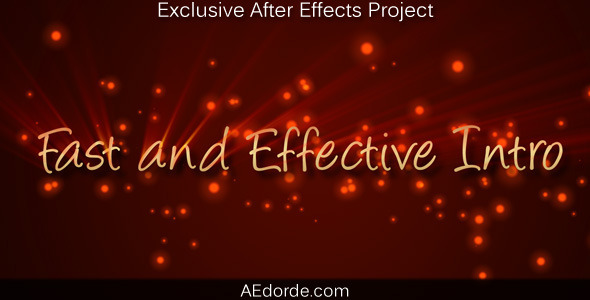 ELEGANT LOGO EXPLOSION is short and powerful logo animation. 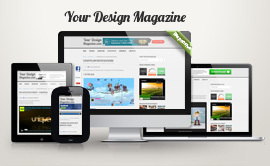 It can be customized with few clicks, in one minute! HARD METAL LOGO is short and powerful logo animation for various purposes. 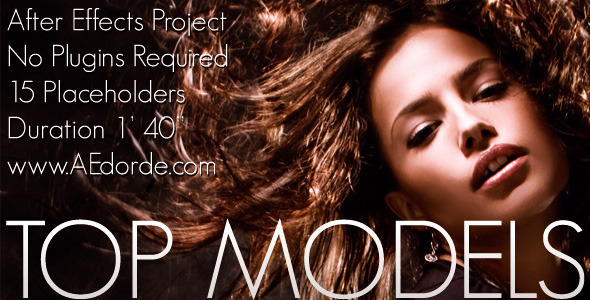 TOP MODELS is my new videohive after effects project, perfect for party, corporate or fashion presentation. As you can see in preview, you can use images or videos, customization steps are same. 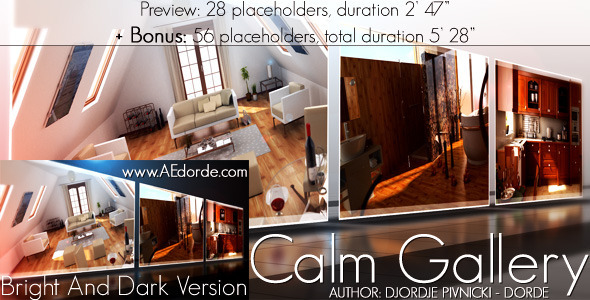 Calm Gallery is exclusive after effects project and it can be purchased only on videohive / envato marketplace. 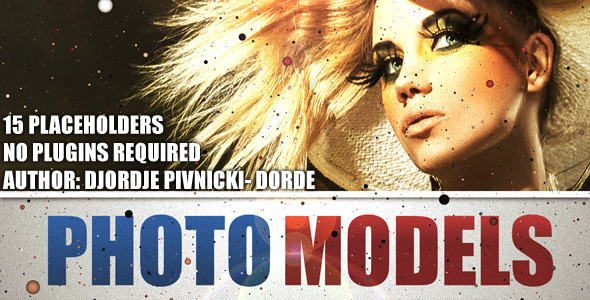 – No plugins used or required! 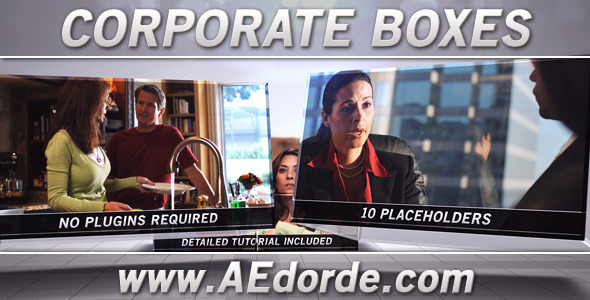 “HAPPY DAY 3in1” is exclusive after effects project and it can be purchased only on videohive / envato marketplace. As you can see in preview this project contains 3 projects in 1 item. 3. lowerthird with duration up to 10 seconds – two almost same lower-third animation, only difference is camera motion in beginning. All 3 final compositions are designed in same dynamic style. Work is very detailed, I hope you like it! 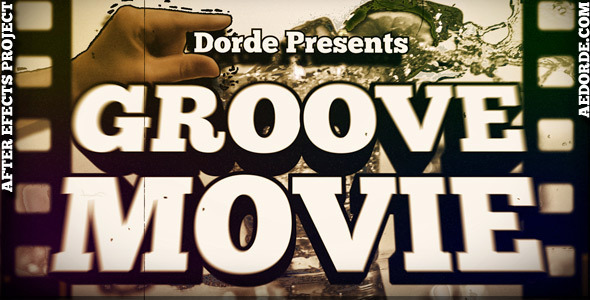 GOLDEN LOGO is exclusive after effects project and it can be purchased only on videohive / envato marketplace. trapcode 3d stroke, shine, CycoreFX hd, sapphire. Please keep on mind that you must have these plugins for project customization! 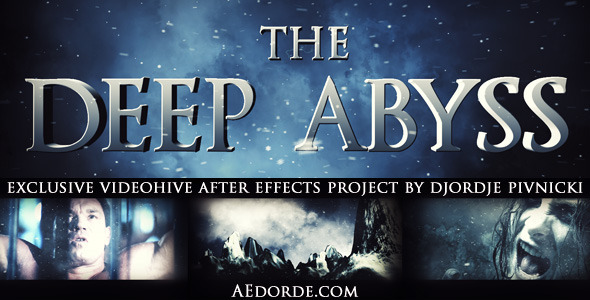 MAGIC LOGO REVEAL is exclusive after effects project and it can be purchased only on videohive / envato marketplace. Short, simply and high dynamic logo reveal in clean, modern and futuristic look. As you can see in preview there are bright and dark version, and color scheme can be changed very easy, with one click. 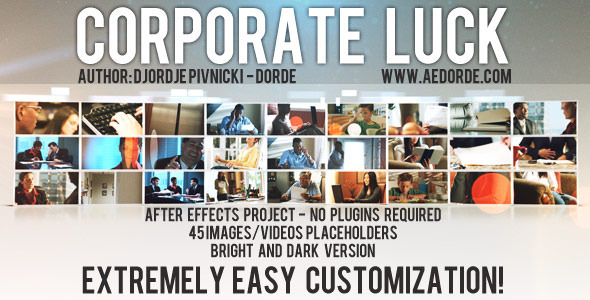 CORPORATE LUCK is exclusive after effects project and it can be purchased only on videohive / envato marketplace.